Roulette has a wheel, a ball and a table marked with separate boxes containing numbers in non-sequential order. Place bets on one or more numbers, then click on ‘spin’ to start the play. The ball is released in the opposite direction of the spinning wheel, and when it stops on one of your numbers, you win. You can bet $1, $5, $25, or $100. 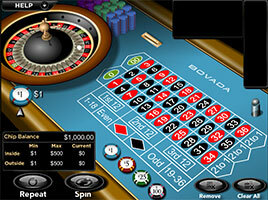 Choose the number of chips to bet per click from $1 up to $500 by clicking on the chip amounts. When you have the right amount in the "Amount to bet per click" area, you can put individual bets equal to the bet amount by clicking different spots on the table. You can bet per spin a max of $500 for Inside Bets and $500 for Outside Bets. Once your bet is placed the ball starts spinning. You win if the ball lands on a number or color that you bet on. Spin - Used to start the ball spinning on the wheel. Repeat - Uses the same chip betas the last spin. Remove - To remove chips in the download version of the casino, right-click on the chip. The difference between American and European Roulette is reflected in the numbers on the wheel and the types of bets you can place. American roulette has both a single zero ("0") and a double zero ("00"), while European Roulette only has a single zero ("00"). European Roulette consists of a wheel of 37 stops and a ball that can land with equal chance on any one of them. The stops are numbered in a non-sequential order starting with 0, colored green, then 1-36, colored either black or red. Bet on where you think the ball will land by placing chips on the Roulette table. Winnings are paid on a multiplier of the bet. You can bet $1, $5, $25, or $100. 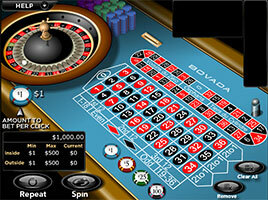 Choose the number of chips to bet per click from $1 up to $500 by clicking on the chip amounts. When you have the right amount in the "Amount to bet per click" area, you can put individual bets equal to the bet amount by clicking different spots on the table. You can bet per spin a max of $500 for Inside Bets and $500 for Outside Bets. Once your bet is placed, spin the wheel. If the ball lands on a number or color that you bet on, victory is yours. There are many types of bets in European Roulette. By placing the chips differently or choosing a neighbor or special bet, you can bet on 1, 2, 3, 4, 5, 6, 9, 12, 17, or 18 numbers. Neighbor Bet When a single number is chosen from the oval table the bet amount will be placed on that number and the two numbers to the immediate right and left of the number. For example: If the player selects the number 5 the bet amount will be placed on the numbers 16, 24, 5, 10 & 23. Payout is equivalent to a straight up bet 35:1. Payout is equivalent to the bet placed. When selected a 6-chips bet will cover 1/3 of the numbers on the oval table starting at thirty-three to twenty-seven as follows: 5/8 + 10/11 + 13/16 + 23/24 + 27/30 + 33/36, each with 1 chip. Payout is equivalent to a split bet 17:1. Look here to find the minimum and maximum totals of the outside bets allowed. Outside bets are the large groupings of numbers along the "outside" of the table. These bets include 1st 12, 2nd 12, 3rd 12, 1-18, 19-36, Even, Odd, All Reds (the red diamond), All Blacks (the black diamond), and the 12-number columns at the end of the table. Look here to find the minimum and maximum total of the inside bets allowed. Inside bets are bets placed directly on a number or between numbers. Spin - Used to get the ball spinning on the wheel. Repeat - Uses the same chip bet as the last spin. Clear All - Removes all previous bets on the table. In the download version click on Clear to remove all previous bets on the table. Remove - Allows you to click on the chips you want to remove from the table. In the download version you can deselect chips by simply right-clicking the chips you want to remove from the table.